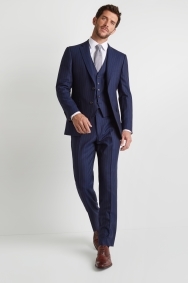 Make the right impression in this ever-stylish blue suit from Savoy Tailors Guild. 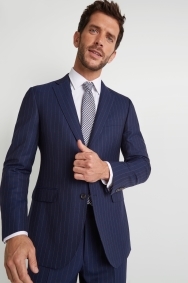 Whether you wear this suit to feel confident as a professional or to celebrate in style at your next special occasion, you’ll be certain to turn heads for the right reasons. Each piece is regular fit, providing maximum comfort and easy movement, and it presents a classic silhouette. Wear a pastel shirt and a bold patterned tie to look sharp and on-trend. 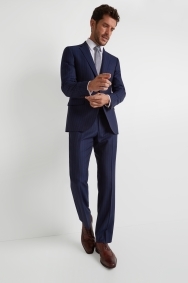 With the suit’s dark hues, you can opt for either black or brown leather shoes to complete the look. 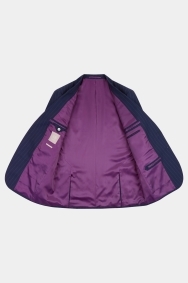 High Quality material and a perfect fitting. I’m broad with a large chest and a toned; muscular stomach. 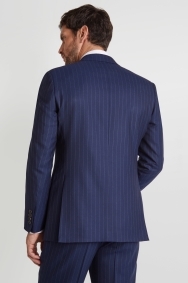 As a result it’s extremely difficult to get good fitting suits without having them tailored. Exactly what I was looking for and fitted beautifully. Quality above my expectations really smart. Had to get the sleeves adjusted £25 to shorten them but you expect that and have to factor in with overall price. Good product and for value. Very comfortable and well made! Excellent suit. Stylish and well made. Beautiful clothing and absolute pleasure to wear.